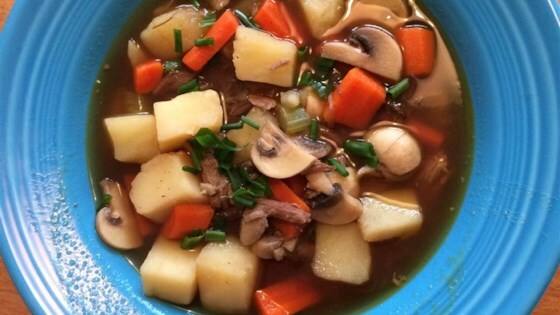 "This rich and satisfying soup is the best I've ever created. Hubby is always excited when I make a prime rib because he knows this soup will follow within a day or two. The ribs are sliced from the prime rib before serving and saved just for this recipe. I always buy a prime rib with the bones in because it makes the roast better tasting and the ribs are a bonus not to be missed!" Excellent holiday dish packed with flavor. I used the pressure cooker (20 min) for the bones. Added quick cook barley and it was an amazing soup that disappeared. Excellent recipe. I added a few things as I always do. Worcestershire sauce, flour, half and half,carrots, garlic ,onion rosemary and thyme. Thickened it up a bit. This was great! I added some more veggies, used two cans of beef broth and a some steak seasoning. A great use of left-over prime rib when you just can't eat another sandwich. Simple and Delicious, I made a 3 rib Prime Rib roast for my Son and I for Christmas Dinner and then made this soup. Very Good!